Courtesy Korea Arts Management Service. Hosted by the Ministry of Culture, Sports and Tourism, the Korea Arts Management Service (KAMS) engages in a broad range of international exchange programs to introduce Korea’s contemporary art to an international audience while strengthening its global network. As a part of this effort, KAMS seeks to award grants to International art organizations that (1) invite Korean artists to exhibit, or (2) collaborate with Korean partners—including curators, galleries, and pertinent organizations—to present exhibitions of Korean artists, thereby assisting high-potential Korean artists with extending their reach to international art markets. 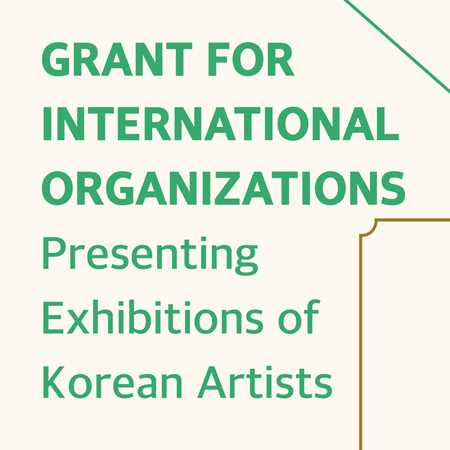 International art organizations and Korean artists are invited to apply for this grant program as follows. –Other materials (optional): Materials that are considered helpful in the screening process, including press releases, portfolios, etc.